25 October. 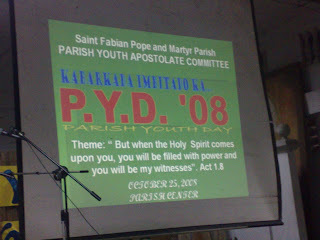 The Parish Youth Apostolate Committee celebrated its annual parish youth day last 25 October 2008. Bro. M arvin Borja, the Parish Youth Coordinator and Bro. Jordan Nabua facillitated the youth celebration. Fr. Oliver E. Mendoza, the parish priest, welcomed the parish youth delegates. 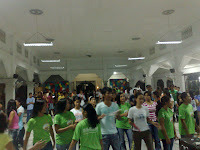 The delegates and participants came from the different barangays of the parish. Bro. Tony Supremido gave the main talk. The new youth program, "Barkadaan nen Kristo" was launched during the whole night celebration. The celebration ended the next day with the youth joining the parish community in the celebration of the 6 o'clock morning mass.